Dhaka, Dec 27, 2011: – Chairman of the Bashundhara Group Mr. Ahmed Akbar Sobhan said that the holistic development of the nation vastly depends on financial accessibility of the commoners through easy banking. He said it while inaugurating the Bashundhara Branch of the Social Islami Bank Limited here in Dhaka on Tuesday. He also said that eminent business and financial entities both local and international origin had started relocating inside the Bashundhara residential area seeing its rapid growth and the ultimate prospects. Founder of the largest and most planned private housing project ever in the country Mr. Sobhan hoped that the housing project would accommodate more than a million families of socio-economic players in the coming years creating enormous potential for the financial institutions like bank. He thanked the SIBL management for establishing the branch and said that presence of the bank uplifted the image of the housing project. Appreciating the roles of the investors and the officials of the Social Islami Bank Limited, he wished the banks uninterrupted growth and suggested to concentrate more on clientele satisfaction as the basic key for expediting the achievement. He also suggested setting up exchange houses in strategically important cities around the world to enhance remittance inflow in the official channel. Mr. Sobhan recalled the assistance of the then Chairman of the Social Islami Bank Limited Dr. Abdul Mannan in recovering the bank from its downfall and hoped that new generation bankers would too stand by the entrepreneurs in the years to come. 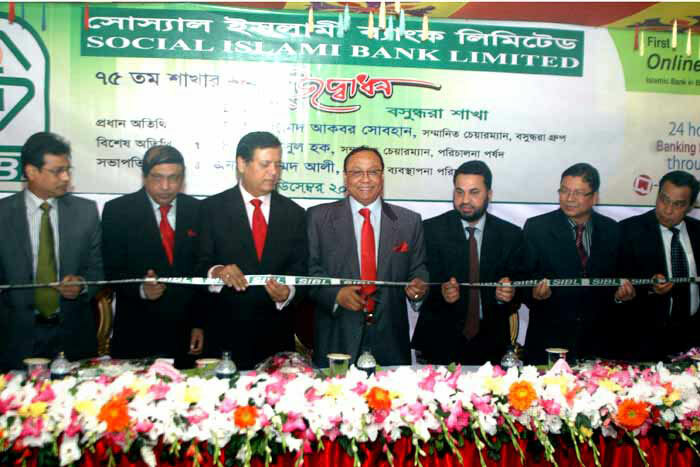 Chairman of the bank Anisul Haque, Managing Director Muhammad Ali also addressed the inaugural function.